Priori Incantatem: Harry Potter Memories – Chapter Two: Reparo! Rowling’s first three Harry Potter novels had completely changed my young life, and by the time first grade was out, I was obsessed with all things Potter – although back then, there wasn’t nearly as much to be obsessed with. I did buy a small poster advertising the first three books from Scholastic that featured some of illustrator Mary GrandPré’s artwork, though, and it’s been on the door to my room ever since. But during first grade, the series had also opened my eyes to how powerful, exciting, and captivating a good story can be. From that point forward, I wasn’t satisfied with just Potter, and I began reading many other things, always craving a good story, and going back to re-read the first three Potter books when I’d exhausted the resources of my school library. Not even this could satiate my appetite, though, and I was so inspired by Rowling’s stories that I felt it was time I write some of my own. My teacher, Mrs. Pattie, fostered creativity in ways no other person I’ve since encountered has, so it was easy to embark on a writing career in her classroom. I wrote my first ‘book’ for a class project. It was called Space Pig, an illustrated adventure about a pig, an alien, and a rocket ship. I had so much fun that I had to continue writing, even when there weren’t assignments. Space Pig soon became a series, and I continued to ‘publish’ new installments throughout Elementary School; but I wrote so many other things too, dozens of stories and poems and anecdotes, many of which I scarcely remember. If I wasn’t reading, I was writing, and visa versa. My knowledge of fiction came from Harry Potter, and I therefore knew that, for a story to work, one needed a cool, relatable protagonist, a fantastic setting, intimidating villains, and big, epic, unforgettable climaxes. These were the conditions under which I wrote creatively, and my stories were praised by my teacher and my classmates alike. In no time at all, I knew what I wanted to do with my life. By the end of first grade, I had already started telling people that I wanted to be a writer when I grew up. In eleven years, nothing has changed. The spell of inspiration Harry Potter had cast over me was irreversible. When first grade got out for the summer in May 2000, I could not have been more excited; not because I disliked school, but because it brought me within a few weeks of the release of the fourth Harry Potter book. This was the first Potter novel I was going to get to read brand new, and the same applied to all Americans, for this would be the first book in the series to get a simultaneous launch in England and the United States, scheduled for July 8th, 2000. As such, hype for the series grew to incredible levels. Everyone I knew was excited for the new book, and thanks to the growing popularity of the Internet, rumors, each crazier than the next, started cropping up everywhere. I spent many a lunch making and debating theories with friends. One rumor that turned out to be true was that a major character would die, and I remember how scared my friends and I were that Ron, Hermione, or Hagrid might bite the dust. Worldwide, the launch was met with the biggest marketing campaign ever given to a novel, characterized by intense spoiler phobia. Stores worldwide, all planning midnight launch parties unprecedented in their scope and ambition, were forbidden from even opening the shipment boxes containing the books until 12:01 AM on July 8th, paranoia encouraged by Rowling herself. In an interview with Entertainment Weekly, she explained that “it wasn't even a marketing ploy. It came from me. This book was the culmination of 10 years’ work, and something very big in terms of my ongoing plot happens at the end…had that got out, there's no way the book would have been as enjoyable to read.” She did not intend it as a marketing gimmick, but I can personally vouch that the spoiler-paranoia contributed to the unbelievable levels of hype that increased with each passing day. In fact, it was the mystery behind the title that drove much of the hype. The original working title, Harry Potter and the Doomspell Tournament, leaked early, and for months, that’s what we all called it, wondering all the while what a “Doomspell Tournament” would look like. I had no idea; all I knew was that it was one hell of an exciting title. As Rowling revised the text, “Doomspell” became “Triwizard,” though a new title reflecting this change never leaked. Rowling finally settled on Goblet of Fire as the final title mere weeks before the book’s release, and at that point, we’d all reserved our copies online or in-store under the “Doomspell” title. The title was chosen so late that in the audiobook, presumably recorded before Rowling picked the official title, narrator Jim Dale merely refers to the book as “the fourth volume in the Harry Potter series.” Hearing the official title was quite a shock, and a bit of a letdown. The word “Goblet” just doesn’t inspire the same enthusiasm as “Doomspell,” even if it is accompanied by the promise of fire. Finally, the book arrived – I practically tore it out of the mailman’s hands – and I was shocked to see just how huge it was. It may not strike anyone today as strange that the new book was long, but at the time, I was used to the relatively short lengths of the first three novels. Goblet of Fire was the biggest book I’d ever seen, and that excited me to no end. Could there possibly be anything better on this earth than an extended stay at Hogwarts? As I dived into the novel, the answer turned out to be a resounding “No!” Goblet of Fire may be long, but every last word is justified. Simultaneously the darkest and most entertaining book yet, Rowling had floored me once again with her seemingly boundless creative invention. The opening 150 pages are some of the most insanely fun material in the entire franchise, as Harry travels with the Weasleys to the Quidditch World Cup. This was a part I read over and over as a kid, wishing I could travel to the magical campsite, get my own pair of “omnioculars,” and watch the Irish and Bulgarian teams duke it out in the sky for athletic supremacy. Of course, things soon take a turn for the worst when “The Dark Mark,” Voldemort’s symbol, appears in the sky in the midst of a post-match riot. It’s a sudden, terrifying descent into dark madness, a gripping, page-turning chapter that sets the stage for how the rest of Goblet of Fire unfolds. Just when you think Harry is having another fun year at Hogwarts, he’s selected to participate in the dangerous Triwizard Tournament; as soon as Harry works up the nerve to ask out Cho Chang, we learn she’s involved with pretty-boy Cedric Diggory; once Harry triumphantly makes his way through the first two tasks, Ministry official Barty Crouch turns up at Hogwarts, insane, and mysteriously disappears. Danger lurks around every corner in Goblet of Fire, but Rowling never diminishes the fun factor; like always, I felt as though I was really at Hogwarts, accompanying Harry on his most exciting and perilous journey yet. The expanded international scope of the novel once again made the heart of Rowling’s fictional world beat stronger; like Harry, I was amazed at the prospect of wizards from other countries, and fascinated by the new characters from Durmstrang and Beuaxbatons. Like all the books, Goblet of Fire is a mystery at heart, one that grows more complex and rewarding with each passing page. Someone wants Harry dead, and Voldemort-related-activity is on the rise, but despite the hints, I don’t think anyone could have predicted the book’s final, now-iconic outcome. Cedric’s murder and the return of Lord Voldemort would obviously change Harry’s life and the series forever, but when I first read the last 100 pages, all I knew was that I hadn’t been so terrified since Ginny was taken into the chamber in book two. Once Harry and Cedric arrive in the graveyard, Goblet of Fire is impossible to put down, and I remember sitting in our family room, planning only to read one chapter, and instead plowing through the last 100 pages in one sitting. I had never read so much at once in my life, but I had no other choice. Voldemort’s resurrection and subsequent duel with Harry is unimaginably horrifying; the connection I felt I had to Harry’s mind made everything in this section seem all the more real, and even though logic told me Harry had to get out of this one alive, death always seemed like the most likely outcome. Still, the most terrifying moments come once Harry returns to Hogwarts and the full scope of the mystery is revealed; Mad-Eye Moody’s true identity – death eater Barty Crouch Jr. – was heartbreaking. Like Harry, I had fallen in love with this character, and would have suspected anyone else of being the traitor before even considering Moody. But Moody’s secret and the explanation for Voldemort’s master plan is a very necessary horror, as it demonstrates just how total and absolute Voldemort’s victory was this time around. Yes, Harry lived, and we would later learn in Deathly Hallows that Voldemort made a fatal mistake in involving the boy in his resurrection, but at the time, the only conclusion I could come to was that this time, the bad guy won, and I had never read a book before, Potter or otherwise, where the good guys actually lose at the end. I thought it was an unbreakable rule of fiction that good always triumphs over evil and that all books must end on an uplifting note. Rowling manages to squeeze a few drops of happiness out in the last chapter, but otherwise, the ending to Goblet of Fire broke every ‘rule’ of fiction I knew at that point, and I wasn’t the only one surprised. The ending shocked people worldwide, and forever changed how modern audiences view children’s literature. Suddenly, with a grisly character death and a victory for the villain, Harry Potter was no longer just a ‘kid’s book.’ Culturally, it became acceptable for adults to read the novels out in public, since the subject matter had become dark enough to pass for ‘grown-up’ reading. Harry Potter had officially succeeded in destroying the long-standing walls between ‘children’ and ‘adult’ literature, demonstrating that with the right amount of darkness, a book can be extra-meaningful and powerful for children while providing great entertainment for adults. I believe this is what sparked the start of unabashed ‘Potter-Mania’ around the globe. Once Goblet of Fire hit shelves and shattered the age-wall, the audience exploded exponentially. At the time, of course, I was not aware of the worldwide impact my favorite series was having, since shortly after finishing Goblet of Fire, I was headed back to school for second-grade, once again under the tutelage of the teacher who had fostered so much creativity and made me fall in love with school: Mrs. Pattie. When my class returned from summer break, it seemed like all anyone could talk about was Harry Potter, and with rumors of a movie on the horizon, it looked like the topic would always be in vogue. Mrs. Pattie liked to read a few “chapter-books,” as we called them, to us every year, and all of us, even those unfamiliar with the series, wanted her to read us a Potter book. 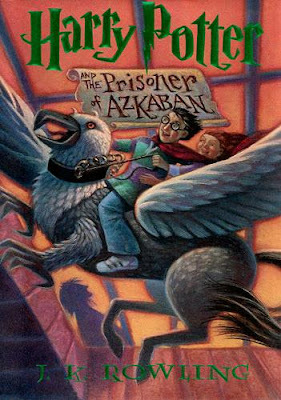 Goblet of Fire was obviously too long to plow through, but Prisoner of Azkaban, a close second-favorite of all who had read it, was just the right length. I volunteered my copy of the book to be the one she would read to the class, and we were off. Reading Harry Potter on my own had been one thing, but I had never imagined it would be so much fun to share that experience with the whole class. “Reading time” quickly became everybody’s favorite part of the day – proof positive that Harry Potter has, in fact, had a drastic influence on getting kids to read, thank you very much – and we would even have some fun discussions about what was going on in the book. I remember how much everyone had to say about the time turner; many believed it would be creepy to go back in time and see yourself, but I was in the camp that thought it would be remarkable. Jonathan, Thank you for sharing not only your Harry Potter book but also your humor and amazing contributions to our class. You are truly one of the smartest people I know. I have loved being your teacher. Love Always, Mrs. Pattie. I have many great memories from first and second grade, some related to Harry Potter, and dozens more to the great friends I made, the academic passion I discovered, and the undying love for creativity forged in that classroom. I may not have a time turner, but when I open up my copy of Prisoner of Azkaban and look at Mrs. Pattie’s message, my memories can still return to this simpler, wonderful time. To be continued in Chapter Three: Petrificus Totalus!